those of you who know me even a little know i journal. i keep a daily journal 90 days at a time. 90 days at a time helps me keep track of my year. 90 days at a time gives me an excuse to be artsy with paper and paint and stamps and what not. 90 days at a time is just a perfect size for me. this is my cover. the blue and brown paper is from a gift bag that contained a birthday gift from my sister. i covered it with a sheet of vellum. i made a large tag from ledger paper from the girls paperie on holiday. the edges are painted with pink acrylic from my stash. 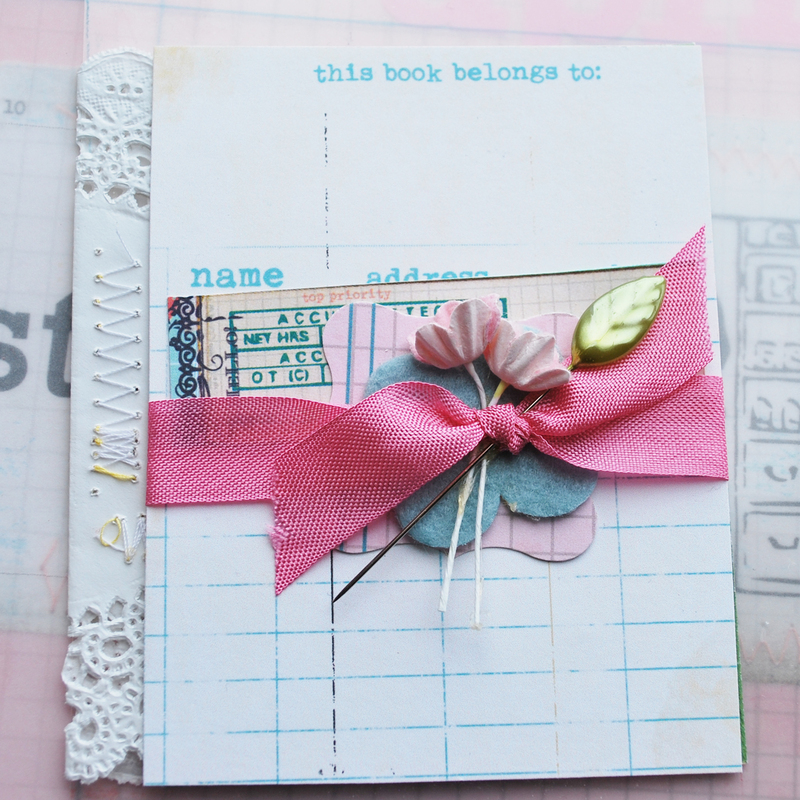 the seam binding in pink is from inspire lovely. the paper punch label is punched from daily junque patterned paper. the butterfly peeking from behind is vellum as is the punched flower under the felt flower from stampin up. just layer away until you like the look. that easy. 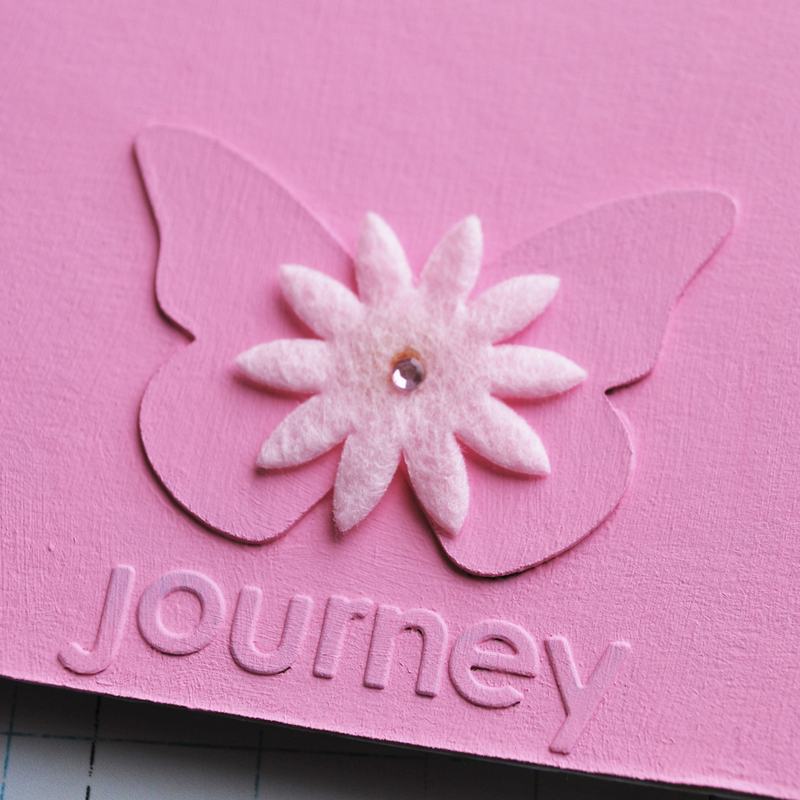 the inner cover is painted in the same pink acrylic paint that has a chipboard butterfly attached. i painted over that as well as the 'journey' letters from basic grey. i will use this technique again and again. i just realized i missed a page. hmm...i shall go on and have to let it go. this is another page inside the book on a clear overlay. there are elements on the other side that you will just have to muse about. i folded a doily (wilton) around the page. the library card is from Ho3 (may it rest in peace). 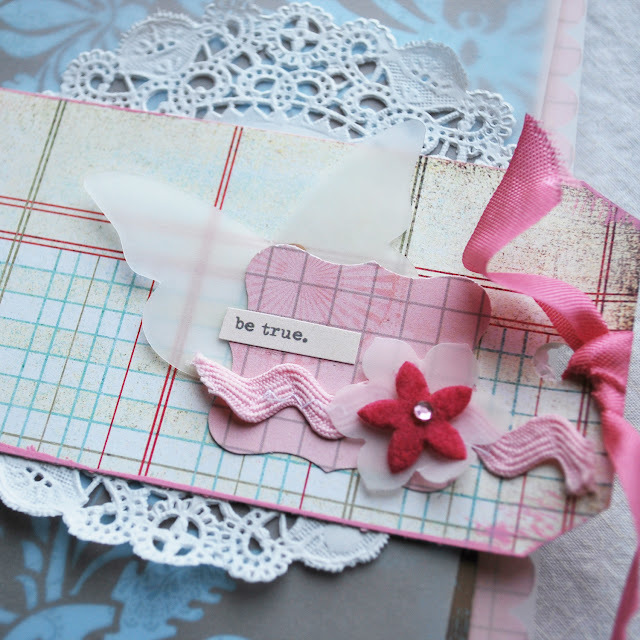 again we have layering with the label paper punch and daily junque paper and old stampin up felt flower. can you tell i dug into my stash? the ticket is also daily junque cut from 12x12 pattern paper. i LOVE this collection. i am hoarding it just a tad. the flowers are from the fabulous debee over at inspire lovely. the study flash card is another favorite from Ho3. the fall junque collection. it is 50% off this week before they close their cyber doors. I stitched it onto the pink graph paper from daily junque. the april letters are from jillibean soup painted in pink. i'm scrappy like that. thank you for letting me share with you today. Beautiful! I followed from MPS:Mom. Love your blog and just spent some time browsing and getting inspired! This is a beauty, Jamie! 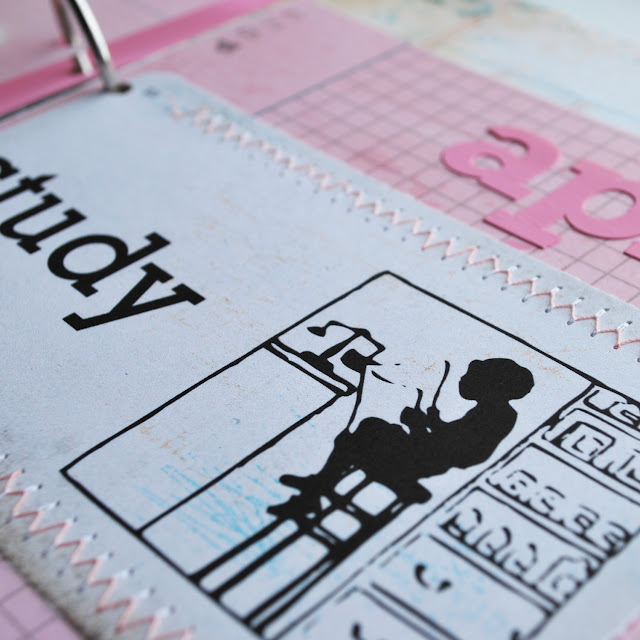 Love the idea of making a 90-day journal. Such a pretty book you've created. I journal periodically in a writer's notebook--just a blank journal, but I write with my students, so that's what I use. What a lovely idea to make something special like this. YEAH! You are so inspired Jamie! when I grow up I want to scrap like you!!!! !